Capriccio showing an interior of a decorated, domed and circular building with the wall divided by columns and piers into screened and vaulted recesses, and two niches containing sculpture and a third niche with a pyramid sarcophagus. 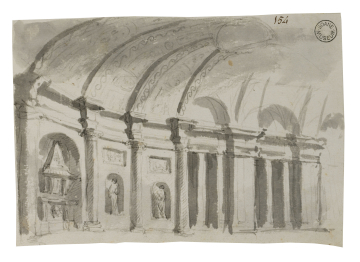 You are here: CollectionsOnline / Capriccio showing an interior of a decorated, domed and circular building with the wall divided by columns and piers into screened and vaulted recesses, and two niches containing sculpture and a third niche with a pyramid sarcophagus. There are similar interior views in chalk in Adam vol.55/80 and 147. The pyramid sarcophagus can be compared with those in the capricci in volume 56. The light and assured draughtsmanship here may possibly be that of Laurent-Benoít Dewez (1731-1812) rather than Robert Adam's.